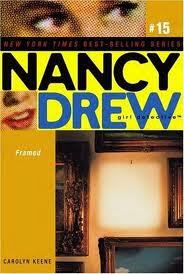 OK, so pretty much everyone knows about the original Nancy Drew Series, which is one of my faves. But now there are new ones coming out! Nancy Drew, Girl Detective by Carolyn Kenne (the author’s code name) are new stories about Nancy, Bess, George, and everyone else. These books are way more modern,like they have happened recently. For example, they have cell phones and use computers while the older books had them go to the library to find things. Also, some of the books come in single form, while there are mini three-part series all on the same topic. I really enjoy these books because they make more sense in modern times than the original books do, like the characters use modern words instead of words like ‘quite’. Also, I think that boys should think about reading any of the Nancy Drew books if they like The Hardy Boys books because they really are exactly the same except the fact that they are girls instead of boys. These books are on a 4th-6th grade reading level. I’ve seen these in the back of my nancy drew series and they look SO COOL!!! !